Mashov group's events have a tradition of business orientation. The group's Vision and its team efforts are focused to build a unique and professional business platform for the exhibitors as well as for all other visitors to the exhibition. Unique presentations, professional seminars and networking, attract visitors from all over the world, coming to meet the Israeli innovation and to create mutual business opportunities. Israel is well known for its innovative approach. Its energy and water resources have been limited and insufficient as from its very early days. As result, a leading and tremendous industry has been developed in Israel. Water technologies from Israel are implemented all over the world. Energy solutions originated in Israel are supplying power to various customers around the globe. International companies, familiar with the Israeli special position also participate in the exhibition in order to benefit from the opportunities created during the exhibition dates. Fresh Agro Mashov is the central meeting point for fresh produce marketing and agriculture innovation, in Israel. Farmers, retailers, wholesalers, packing industry, propagations materials (seeds, plants), chemical, startups and other relevant participants attend the exhibition and the seminars and reception near it. During the years the Exhibition has become a center of new products and technologies' introduction. Being well known for its innovative approach and achievements, Israel has become a magnet, a point of attraction for many farmers, agribusiness men and investors from around the globe. Fresh Agro Mashov creates the perfect meeting points for them. Mashov is a monthly agriculture magazine. It is the leading magazine in Israel and it is known to every farmer, grower, agro-businessmen and stack holder in the Israeli agriculture. Many PR offices and advertisers use Mashov as channel to introduce and promote their products and ideas in the Israeli agriculture. 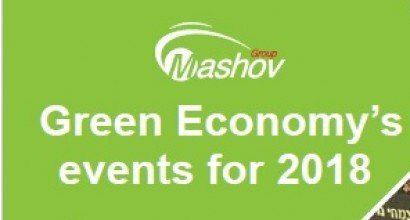 Gardening and landscaping creates the 3rd leg of Mashov group's business Activities and complete its Green Economy triangle. Ganim Yerukim magazine, published by mashov group is a leading force in Israel. Its printed issues get nearly to every nursery and garden center, professional gardeners, Contractor and landscape architect.